The outcome of the UN Security Council meeting does not bode well for the people of Palestine. 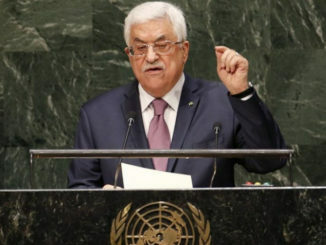 Palestinian Authority leader Mahmoud Abbas gave a lengthy speech during which opportunities for hammering out the truth of the matter were reduced to statements showing that little has changed in terms of how the PA interprets history and timeframes. Abbas declared that Israel “has transformed the occupation from a temporary situation as per international law into a situation of permanent settlement colonization.” He also described the PA as having become “an Authority without authority.” The inaccuracy of these statements is the suggestion that their claims have just become obvious, highlighting the refusal to recognize that the facts of the matter have been very clear since the start of the occupation — Zionism is an expansionist ideology forever seeking “Greater Israel” — and the creation of the PA, whose sole role is to serve Israeli interests. Having allocated enough space in order to portray the alleged deterioration of the situation as opposed to current circumstances being the result of a premeditated plan of colonization and collaboration, Abbas is entrenching a poor bargaining position for Palestinians. In other words, forget about a state; you can have the crumbs off the table, which is better than no crumbs at all. Haley’s response cannot be read solely within the context of a diatribe against Abbas. It is a direct attack on Palestinians rights and aspirations for liberation. Indeed, this exchange portrays the consequences which Palestinians suffer as a result of political isolation. 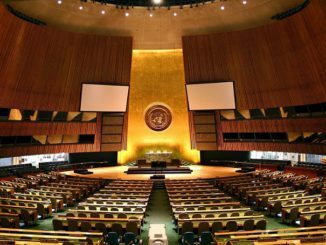 The rhetoric within international institutions takes place in such a detached manner that it is possible to discern a narrative for UN forums that only skims the surface of what is deemed acceptable to discuss. The choice of discourse has been determined away from Palestinian reality. The diverging narratives are imbued with recognition and repudiation, with the latter reserved for Palestinians. 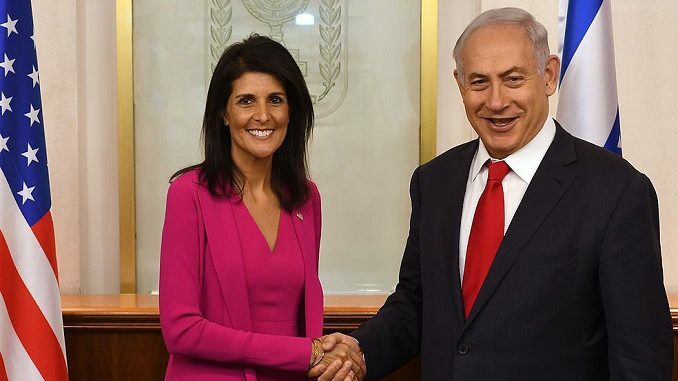 Haley is emphasizing this discrepancy and exploiting it at a time when Israel and the US are working overtly to accelerate the colonization process so that “Greater Israel” becomes more of a reality day by day. Recognizing the colonial narrative at an international level is aided by the fact that Abbas is not speaking for all Palestinians. 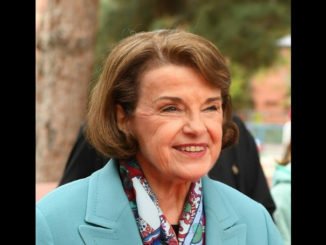 His calculated discourse, which should generate outrage at the way decades of Israeli violations are being recognized by himself and the PA so belatedly — particularly after US President Donald Trump’s unilateral declaration on Jerusalem — is a blatant example of pandering to colonial complicity. The fact that Abbas continues to engage with the international community without acknowledging its role in isolating Palestinian voices can only mean an extension of the current situation, with long-term benefits for Israel. Engaging with the US after the measures it has taken to hinder the legitimate claims of Palestinians on their territory to the point of elimination should not be an option. Whatever Abbas chooses, and recent history has shown many examples of how the PA fluctuates from one degenerative option to another, it is important to remember that the decisions are not Palestinian choices. The people of Palestine have been experimented upon from all sides — even militarily — and options offered by parties across the political spectrum ignore the fact that the genuine possibilities for Palestinians can only be generated from within; Abbas knows this only too well. It is with calculated intent that the entire world has been allowed to impose anything and everything upon the Palestinians apart from their legitimate rights. The added indignity is having these same impositions articulated in the name of the Palestinian people by someone like Mahmoud Abbas.